On June 24, the Islamic Circle of North America's (ICNA) Council for Social Justice expressed support for Senior Al Qaeda Leader Muhammad Rahim by sharing a propaganda video produced by CAGE, a frequent propagator of terrorist apologias. The video presents Rahim as a pious, innocent man, tortured for no reason at all. To the extent that CAGE's propaganda acknowledges the charges against Rahim at all, it downplays them, naming him as an "alleged...translator for Al Qaeda... But never charged with any crime." Who is Rahim really? 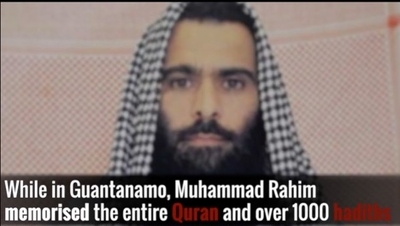 Pentagon spokesman Bryan Whitman told the press Rahim was: "one of [Osama bin Laden's] most trusted facilitators and procurement specialists... He had knowledge of or was involved in al Qaeda attacks planned against coalition forces in Afghanistan." This is yet another example of ICNA's longstanding, regular support for Islamist extremists. 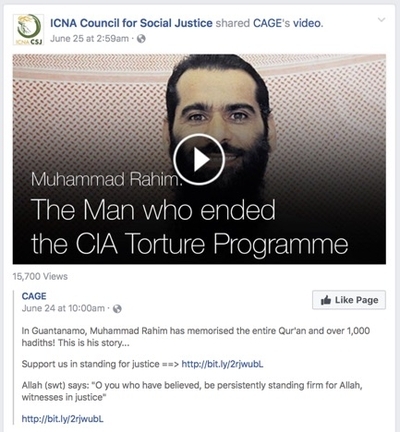 In February this year, ICNA also shared a video on Facebook advocating for the convicted terrorist Aafia Siddiqui. Former FBI Director Robert Mueller named Siddiqui in 2004 as "an al-Qaeda operative and facilitator." She received an 86-year sentence for two counts of attempted murder. When she was arrested, Siddiqui possessed notes and a computer with instructions for making bombs, descriptions of New York City targets, and two pounds of cyanide. During her trial, Siddiqui demanded that Jews should be excluded from the Jury. CAGE, the video's creator, also has a long record of working with and supporting extremists. The organization's Outreach Director is Moazzam Begg, a former Guantanamo Bay detainee until his release in 2005. Begg signed a confession where he admitted his role in Al Qaeda as a recruiter, attendee at terrorist training camps, and source of funding. (Begg claims this confession was done under coercion but four investigations failed to find evidence to support that claim.) He further admitted to The Nation that he had fought in Bosnia. What does this reveal about non-violent extremist groups in America? Organizations like ICNA are more concerned with promoting a conspiratorial narrative of Muslim victimhood and persecution rather than acknowledging the very real, disturbing facts surrounding Islamist terrorists' violent intentions.